Is Shade 30 (Swee Cola) right for you? 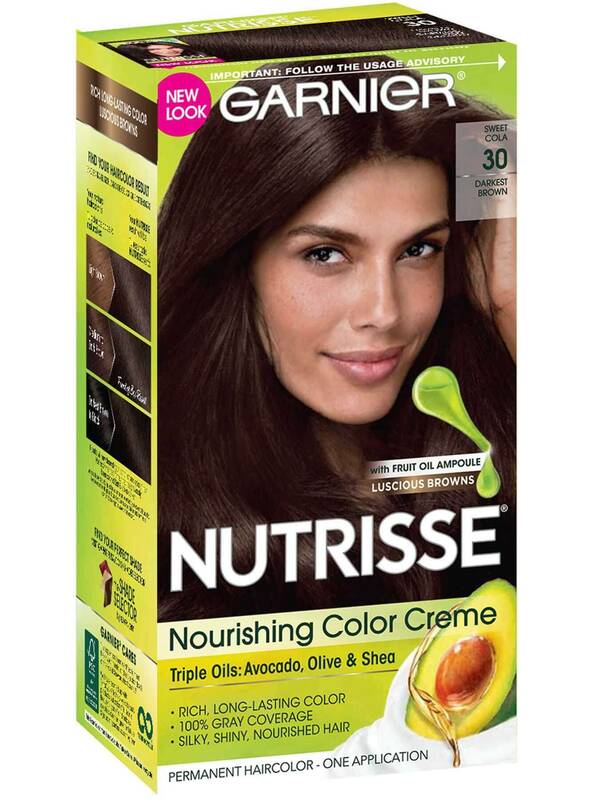 Garnier Nutrisse Darkest Brown 30 (Sweet Cola) is a rich, natural, deep brown shade that will allow your natural tones to show. It also provides 100% gray coverage. 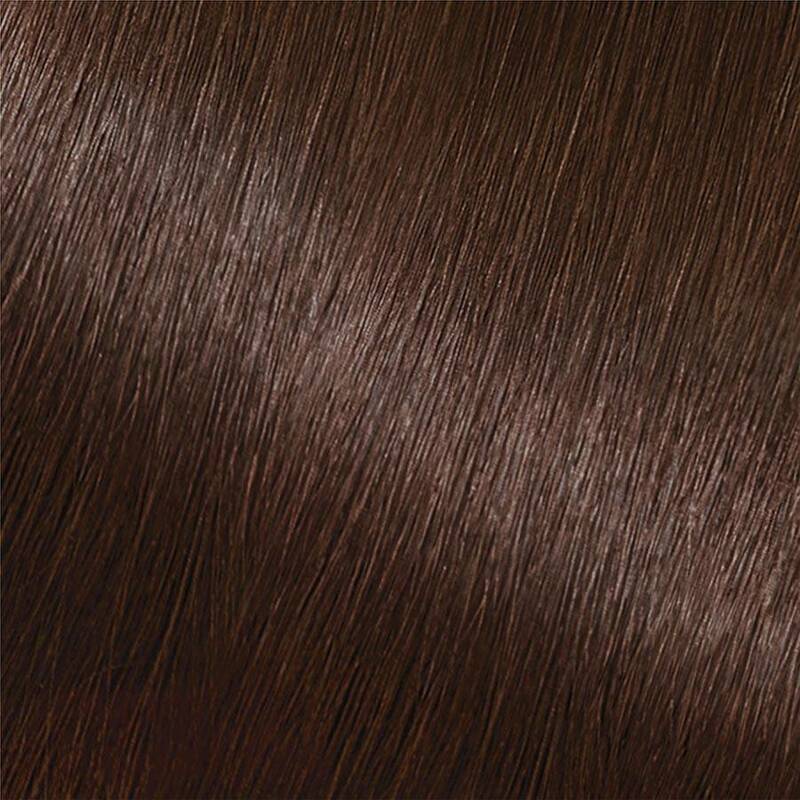 It is best for anyone with natural hair between light brown and black. If you prefer a lighter color that still reflects naturally, try ark Brown 40 (Dark Chocolate) or if you would like to remain in the darkest brown range but would like to try other reflects and tones, shade 31 or 33 might be for you. *For women with currently color treated hair, there are special considerations for the color result you can achieve. Because of this, we do not recommend shade 30 (Sweet Cola) for hair that has been previously colored Soft Black 20 (Black Tea) or darker. For more help, use our Shade Selector Tool to find the perfect shade for you! Nutrisse Colorant: Aqua/Water, Cetearyl Alcohol, Propylene Glycol, Deceth-3, Laureth-12, Ammonium Hydroxide, Oleth-30, Lauric Acid, Hexadimethrine Chloride, Glycol Distearate, Polyquaternium-2, Ethanolamine, Silica Dimethyl Silylate, P-Phenylenediamine, Ci 77891/Titanium Dioxide, 2,4-Diaminophenoxyethanol Hcl, M-Aminophenol, Ascorbic Acid, Sodium Metabisulfite, Dimethicone, Pentasodium Pentetate, N,N-Bis(2-Hydroxyethyl)-P-Phenylenediamine Sulfate, Parfum/Fragrance, Carbomer, Resorcinol, Vitis Vinifera Seed Oil/Grape Seed Oil. F.I.L. D35182/4. Fruit Oil Concentrate: Paraffinum Liquidum/Mineral Oil, Vitis Vinifera Seed Oil/Grape Seed Oil, Parfum/Fragrance, Tocopherol, Rosmarinus Officinalis (Rosemary) Extract. F.I.L. D25829/5. Rinse-Out Conditioner: Aqua/Water, Cetearyl Alcohol, Elaeis Guineensis Oil/Palm Oil, Behentrimonium Chloride, Pyrus Malus Extract/Apple Fruit Extract, Glycerin Parfum/Fragrance, Stearamidopropyl Dimethylamine, Niacinamide, Pyridoxine Hcl, Butyrospermum Parkii Butter/Shea Butter, Citric Acid, Olea Europaea Oil/Olive Fruit Oil, Saccharum Officinarum Extract/Sugar Cane Extract, Benzyl Alcohol, Chlorhexidine Dihydrochloride, Persea Gratissima Oil/Avocado Oil, Ribes Nigrum Oil/Black Currant Seed Oil, Linalool, Citrus Medica Limonum Peel Extract/Lemon Peel Extract, Ci 19140/Yellow 5, Camellia Sinensis Extract/Camellia Sinensis Leaf Extract, Ci 15985/Yellow 6. F.I.L. D35637/3. Nutrisse Developer: Aqua/Water, Hydrogen Peroxide, Cetearyl Alcohol, Trideceth-2 Carboxamide Mea, Ceteareth-25, Glycerin, Pentasodium Penetate, Sodium Stannate, Tetrasodium Pyrophosphate, Phosphoric Acid. F.I.L. D12836/26. Rated 1 out of 5 by HeckNo from Didn't work on my grays I bought this yesterday. I wanted to cover a gray streak growing in at my forehead. I had about an inch patch to dye. I did two treatments 6 hours apart with no success either time. Looks absolutely the same as it did before. I am not sure why nothing changed, the directions were 1. 2. simple and the mixture looked ok, although it took an hour or two to activate into full color. Rated 1 out of 5 by catsarah00 from Black. I dye my own hair quite often (in the healthiest way you can) so I know this wasn’t my fault. I wanted to go back to my brown hair to have it be healthy for a little while and definitely didn’t expect it to come out JET BLACK. Rated 5 out of 5 by EMK 47 from True dark brown I am very happy with the results. 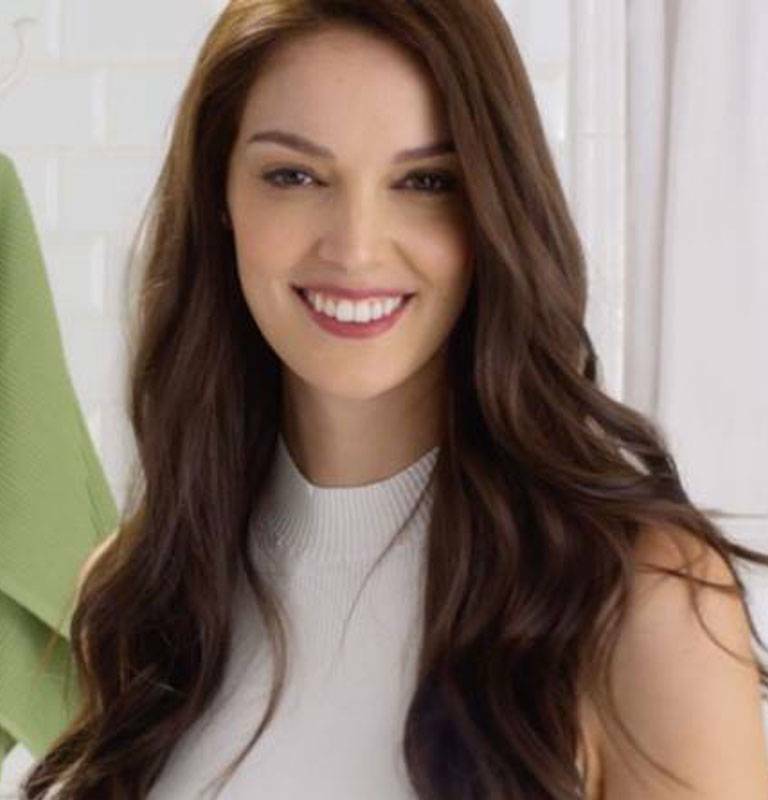 I have tried every type of brown hair color to try and match Mediterranean dark brown hair. They either turned out too red green purple or ugly off brown. This is dark at first but fades to the perfect warm coffee brown. Rated 3 out of 5 by Tccarter from Too dark I wanted to go darker for fall/winter but didn’t want to go back to black like I had done in the past. So I thought the darkest brown was my safest bet... wrong! This is basically black which isn’t at all what I wanted so I’m a tad bit disappointed! I love this brand because my color always turns out nice and rich but the box doesn’t accurately represent the color you’re going to get. Rated 3 out of 5 by jfnichols from Color results are darker than it used to be. I have used this color for years and now for some reason starting about 4 months ago it is much darker than it ever has been. I have done the same thing for years, leave on my roots for 22 min and then pull through the rest of my hair. I have a distinct line in my hair now and that started 4 months ago. Not sure what you all have done to the formula but it is darker now for some reason. I liked my color for years but now I have had to go to a salon to get it to blend. I had to go to a salon to fix this last month. I tried it again this month and it is just as dark. As mentioned previously I have been using Sweet Cola as my go to color for years. Now I need to find something different.